Two recent attacks by al-Shabaab forces against forward operating bases of the African Union Mission in Somalia (AMISOM) in Leego and Janaale have brought renewed attention to the issue of AMISOM’s fatalities. In the most recent attack on the Ugandan base at Janaale, al-Shabaab claimed it had killed “more than 50 Ugandan crusaders” while the Ugandan government claimed that it had really lost just 12 of its soldiers. What is the truth about how many personnel have died while serving in AMISOM? The short answer is that until AMISOM’s troop- and police-contributing countries (T/PCCs) publicly release such information there is no way of knowing. The longer answer is that until then, we should be skeptical about the accuracy of all estimates and be aware of the politics and inherent limitations of ongoing efforts to estimate AMISOM’s fatalities. This topic is important for several reasons. First, peacekeepers that die while performing tasks mandated by the United Nations Security Council and AU deserve to have their sacrifice publicly recognized. I say this despite the fact that, to my knowledge, neither the Security Council nor the AU has asked, let alone pressured, AMISOM’s contributing countries to publicly declare their dead. Second, the families of fallen peacekeepers deserve to receive the death compensation payments due to them as spelled out in the Memorandums of Understanding (MoUs) signed between the AU and AMISOM’s contributing countries. Reports persist that compensation payments to next of kin are sometimes delayed for long periods and might not always be for the amount stated in the MoUs. And, third, the deliberate policy of keeping such information secret has arguably contributed to undermining AMISOM’s credibility to the extent that its strategic communications are perceived by many Somalis to be unreliable. No modern peace operation can succeed if it does not have the support of the local population and greater clarity about the issue could be an important part of re-establishing AMISOM’s credibility as a trusted source of information and demonstrate the sacrifice AMISOM’s contributing countries have endured in the effort to bring peace to Somalia. This article summarizes some of the most important attempts to find out how many AMISOM peacekeepers have died during the course of this mission. Deployed in March 2007 to Mogadishu, AMISOM started life with an initial contingent of about 1,600 Ugandan soldiers who were largely confined to a few strategic locations in Mogadishu. By January 2014, it had become the AU’s largest ever multinational force, consisting of over 22,000 uniformed personnel (see figure 1). Today, AMISOM’s troop-contributing countries are Burundi, Ethiopia, Kenya, Djibouti, and Uganda (Sierra Leone withdrew its battalion of troops in early 2015). Source: author’s calculations from AU and UN sources, updated from here. AMISOM always more closely resembled a war-fighting operation than a peacekeeping mission. As a direct result, the key operational decisions were almost always taken by the national contingent commanders and the AU Peace and Security Council and the AU Commission always had to work particularly hard to try and provide strategic political coherence across the different contributing countries. Unfortunately, this was not always possible. In addition, and particularly since 2009, AMISOM became one of the world’s most dangerous peace operations. Measured by the number of fatalities per peacekeeper deployed, AMISOM is probably the most deadly peace operation ever conducted in Africa. 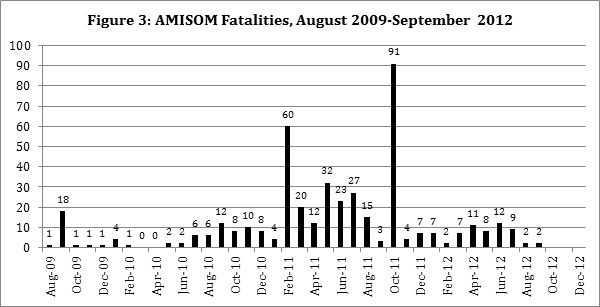 I write probably because there are no publicly available records of AMISOM’s fatalities. Unlike the UN, which publicly catalogs peacekeeper fatalities suffered during its operations by date, mission, nationality, and type of incident, the AU provides no such records for AMISOM. Interestingly, the AU’s peace operation in Central African Republic (MISCA) did maintain a public record of its fatalities, in part to show the level of sacrifice demonstrated by the peacekeepers and to build public support for the mission. The absence of reliable figures for AMISOM has led journalists, commentators, and academics to speculate on how many AU personnel have died while serving on this mission. To my knowledge, the highest estimates claim that between March 2007 and January 2015, AMISOM lost “perhaps over 4,000” troops – although note that Mills and Davis provide absolutely no evidence for this claim. The following year, the controversy about AMISOM’s fatalities attracted the international spotlight once again when in May 2013 UN Deputy Secretary-General Jan Eliasson told a press conference that “You would be shocked to learn that maybe it is up to 3,000 AMISOM soldiers that have been killed during these years [2007-13] that AMISOM has been there [Somalia].” Eliasson provided no further evidence for his claim. Once again, AMISOM responded quickly. But this time AMISOM spokesman Ali Aden Hamoud said he could not confirm or deny the death toll because “That responsibility belongs to each one of those contingents, or troop-contributing countries.” AMISOM’s Twitter account, however, took a more definitive line posting on May 10 2013 that Eliasson’s figure was “simply untrue.” Shortly afterwards the UN published a retraction of Eliasson’s statement saying that it was based on “information from informal sources” and should not be taken as accurate. These arguments have occurred periodically because there is no comprehensive public record of AMISOM’s fatalities. The AU says there is no such record because the decision to release that information rests with the contributing countries not the AU Commission. That is, it has always been up to the governments of Burundi, Djibouti, Ethiopia, Kenya, Sierra Leone (no longer a TCC), and Uganda to release, or not, information about their fallen personnel. All of them have chosen not to publicly release comprehensive information about this subject. The most prevalent explanation for refusing to release casualty figures is that the contributing countries see little to be gained by making these numbers public. Because AMISOM is essentially a war-fighting operation conducted by a multinational coalition of the willing rather than a more traditional peacekeeping mission, the stakes are thought to be higher when revealing numbers of fatalities because of their impact on the propaganda war and troop morale. As a result, there have been only intermittent AU and AMISOM press releases detailing casualty figures for specific incidents rather than a comprehensive and public accounting of the dead. Such press releases and statements have become more common in recent years but they were very limited for the first few years of AMISOM’s operations. So what are the best estimates of AMISOM’s fatalities? Unfortunately, existing conflict databases do not provide the answer. The Uppsala Conflict Data Program (UCDP), one of the most respected institutions working in this area, has catalogued 13,384 battle-related fatalities that occurred in the war between the various Somali authorities and al-Shabaab between 2007 and 2014. But the UCDP does not provide a detailed breakdown of these fatalities and hence it is not useful for counting AMISOM deaths. The same goes for the Armed Conflict Event and Location Data project (ACLED), which recorded 3,485 fatalities in violent incidents involving AMISOM between 2007 and 2014. This number includes unverified reports and declarations from all sides in the conflict and includes fatalities among civilians, al-Shabaab, and various types of pro-government forces, as well as AMISOM personnel. ACLED does not parse out the fatality data according to the type of actor. Hence, it is impossible to determine a precise number of AMISOM fatalities. Instead, the best publicly available figures on AMISOM’s fatalities can be found in the Stockholm International Peace Research Institute (SIPRI) yearbooks published for the years 2009 and 2014. As a point of clarification, the AMISOM fatality estimates provided in the SIPRI data do not include any of those personnel who died during Kenya’s unilateral Operation Linda Nchi (2011-12), or the unilateral operations conducted by the Ethiopian armed forces and Liyu police inside Somalia between late 2011 and January 2014, when Ethiopia officially became a troop-contributing country within AMISOM. Even today, however, Ethiopia continues to deploy additional troops and police inside Somalia but outside of AMISOM, apparently under a bilateral agreement with the Federal Government of Somalia. So what does the SIPRI data conclude? 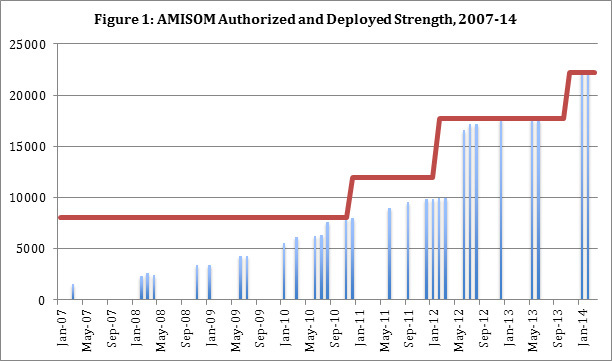 The SIPRI team acquired its estimates directly from AMISOM. This information was collected as part of SIPRI’s ongoing effort to develop a database on multilateral peace operations. 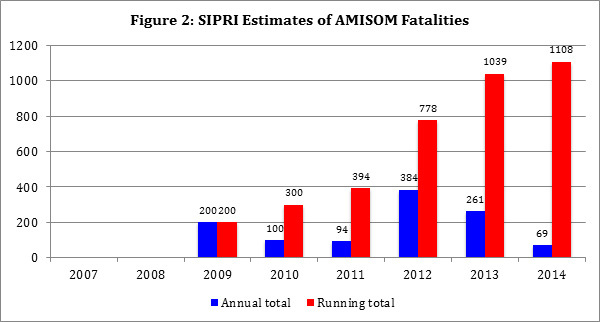 SIPRI concludes that between January 1 2009 and December 31 2013, AMISOM suffered 1,039 fatalities (see figure 2). The SIPRI team believes this to be a conservative, minimum estimate. This was broken down by year as follows: 200 in 2009, 300 in 2010, 94 in 2011, 384 in 2012, and 261 in 2013. In addition, during 2014, AMISOM told SIPRI that it had suffered a further 69 fatalities as a result of hostile action, bringing the overall total to 1,108. AMISOM maintained that the 2014 figure only covered fatalities suffered due to hostile action and did not include other causes such as illness or accident. It is also important to note that the SIPRI figures were first published in the 2009 Yearbook. In other words, SIPRI has no data for AMISOM fatalities for the period between the start of the mission in March 2007 and December 31 2008. What do the SIPRI figures reveal? First, they differ quite significantly from much of the media commentary about AMISOM’s fatalities. Not surprisingly, media outlets in Uganda have generally provided much lower numbers of fatalities. To take just two indicative examples, Uganda’s New Vision newspaper was claiming in late 2009 that only 34 AMISOM peacekeepers had been killed, half of whom were Ugandan. By the end of January 2010, the paper suggested 37 Ugandan troops had been killed. Judged against the SIPRI data, such media outlets are clearly not to be trusted as reliable. Second, the SIPRI figures also appear to be higher than the estimates of AMISOM fatalities found in the numerous WikiLeaks cables written by US diplomats about AMISOM and its contributing countries. A survey of the cables produced by US embassies in Ethiopia, Kenya, Uganda, Burundi, Djibouti, and Sierra Leone (AMISOM’s TCCs) provide a large number of snapshots of fatality estimates and figures for specific incidents. To take just a couple of illustrative examples, in February 2009 the US embassy in Kenya concluded that only three AMISOM troops had been killed during 2008. And, in January 2010 the US embassy in Burundi concluded that 25 Burundian peacekeepers had been killed since the country first deployed its troops to Mogadishu in December 2007. Assuming a roughly even split between Burundian and Ugandan fatalities during 2009, this estimate appears very conservative compared to the SIPRI data. It’s also notable because it was widely reported that 23 Burundian troops died in just two suicide bomb attacks on February 22 and September 17 2009. In my own research on AMISOM, I have communicated with various individuals connected to the mission on a confidential/not-for-attribution basis. As part of that research, I have gathered some information about AMISOM’s medical records and the AU’s financial procedures related to the mission’s death and disability compensation payments. Records from AMISOM’s medical facilities between March 2007 and February 2011 suggest that it suffered 205 fatalities during this period as well as 798 wounded. There were 110 Ugandan fatalities and 95 from Burundi. Information contained within the AU’s financial records related to death and disability compensation suggests that between August 2009 and September 2012, AMISOM suffered 439 fatalities: 22 during 2009, 59 during 2010, 298 during 2011, and 60 during 2012 (see figure 3). If both these sets of medical and financial records were accurate then we could conclude that, according to the financial records, 145 AMISOM deaths occurred between August 2009 and February 2011, leaving 60 fatalities for the period between March 2007 and July 31 2009, based on the medical records total. If correct, nearly one-fifth of that total probably occurred on a single day: February 22 2009, when US and UN sources noted that 11 Burundian troops were killed by two suicide bombers. The figures from AMISOM’s medical and the AU’s financial records also show some discrepancy with the SIPRI estimates for some of the same years. For example, assuming that the 200 fatalities recorded by SIPRI in 2009 were spread relatively evenly across the calendar year, then the financial records estimate of 22 deaths during five months of that year seem conservative, especially considering that a single suicide attack on September 17 2009 reportedly killed seventeen AMISOM troops (12 from Burundi and five from Uganda). During 2010, SIPRI figures list 100 fatalities whereas the financial records suggest a lower total of 59. During 2011, in contrast, the SIPRI estimate is 94 fatalities but the financial records suggest a much higher total of 298 fatalities. Then in 2012, SIPRI data suggests a much higher total of 384 fatalities, compared to the financial records for January-September 2012, which list 60 fatalities. Of course, the figures gleaned from my own research are also far from comprehensive and suffer from several limitations. Regarding the medical records, there is no guarantee that all of AMISOM’s fatalities passed through the mission’s medical facilities. Regarding the financial information from the AU Commission, there are several ways in which they might be problematic. First, the AU Commission has not kept comprehensive records of AMISOM fatalities (let alone the larger number of casualties) since the start of the operation in March 2007. The process of keeping records began only in 2009. Second, because the AU Commission lacked a persistent presence in Mogadishu, during the mission’s early years, and later across the areas of AMISOM’s deployment outside of Mogadishu, it was unable to independently verify the information about casualty figures it received from the national contingents operating in the field. Third, where the AU Commission did investigate and analyze information about recorded fatalities, it was usually to determine details related to compensation payments to the next of kin. As a result, this raises the question of whether the claims made for compensation by the contributing countries are identical to the true numbers of their fatalities, and whether some contributing countries reported more accurately to the AU Commission than others. Without a full and public record it is impossible to know the answer to these questions. What can we conclude from these efforts to estimate AMISOM’s fatalities? First, so far, it remains impossible to provide an accurate figure for the number of peacekeepers who have sacrificed their lives serving on this mission. Second, the highest estimates of AMISOM fatalities claimed by some analysts and some UN officials and diplomats diverge considerably from the AMISOM estimates provided to SIPRI, but also from medical and financial records I have seen as part of my research about the mission. Third, arguments about AMISOM’s fatalities will continue to form an important part of the propaganda war waged by all sides in this bloody conflict. In January 2015, the AU Commission chairperson, Dr. Nkosazana Dlamini Zuma, expressed her “deep appreciation to our peacekeepers … for their heroic contribution to peace and to service of their continent and its people.” She went on to say “We should have a monument for our AU peacekeepers who have lost their lives in the duty of the peoples of the continent.” At the very least, this means that AMISOM’s fallen peacekeepers deserve to be publicly recognized for their sacrifice. AMISOM’s contributing countries should name their fallen peacekeepers and ensure that their families receive the compensation they are due, as written in the AU’s agreements with its contributing countries. Paul D. Williams is Associate Professor of International Affairs at the George Washington University. He is working on a book about the history and operational challenges of the AU Mission in Somalia. @PDWilliamsGWU.